SPA-ING...The latest trend in social gatherings! Be on the cutting edge and Spa with the Best! A Paradise Spa Party is the perfect way to entertain your friends, family or co-workers and treat yourself at the same time! Then submit your guest list to A White Pond Paradise. We can send out custom invitations. Yes, a minimum of six guests in attendance is required. How does the pricing work for guests? Each guest may choose any service offered at a discounted rate on the Spa Party price list insert. All other services will be charged at regular pricing. Each guest will also receive 15% off any retail product purchase that day, as well as a 10% off coupon for a future visit. Paradise Spa Parties are for any occasion... bachelor/bachlorette parties, wedding/baby showers, birthdays, anniversaries, corporate reward parties, or just to relax and be with friends. A unique spa concept for groups. Relax, unwind, and have fun with our team of spa professionals. 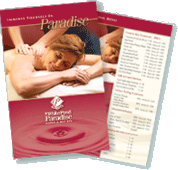 Download a Spa Party Brochure for pricing information.